Currently working on a game, and i've gotten to the point where i need to implement multiplayer functionality. 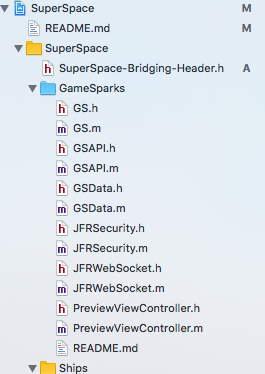 I'm trying to load in the GameSparks SDK into my project but am unable to properly import the module and i'm not quite sure whats going on. and get no errors, everything compiles fine, however I have no access to the GS module that appears to be the core of the GameSparks SDK. Has anybody had any luck with this SDK in iOS before? Maybe there is something about bridging between Objective-C and Swift that i'm not understanding? You should set the bridging header to the target -> Build Settings. Search for bridging in search panel. Refer the following image for clear picture. Try and share your results. Not the answer you're looking for? Browse other questions tagged ios objective-c swift gamesparks or ask your own question.